Our unmatched single-stage trigger was the second product JP ever created. There's no mistaking the clean pull and crisp break of a JP. 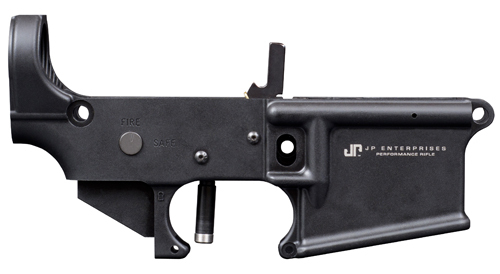 The JP Lower with Trigger (LWT) offers one of our hand-selected forged lower receivers and a complete shop-quality JP fire control package at a fantastic value. If you're into quality without compromise, this is choice for your next AR build. While we can ensure fitment on matched receiver sets, slight variations in manufacturing tolerances, metal finishing and coatings make final fitment between one of our upper receivers and your own impossible to guarantee. Stripped JP receivers are available with any of the custom lasermarks we offer on our complete rifle builds. Click here to read more and view the gallery. Must ship to FFL holder. This item cannot be ordered online. Please call (651) 426-9196 to place order.